Dr. Jessica Davis, DC | Chiropractor is the Senior Millar Chiropractor at Millar Chiropractic Jones Valley. She brings that wonderful patient knowhow experience to each patient. Dr Jessica, as she likes to be called, practiced and interned under Dr Millar at the Millar Chiropractic - Huntsville (Downtown) before moving her practice to the Jones Valley clinic. Dr Jessica uses many techniques such as Activator, Atlas Orthogonal, and Manual Thompson techniques. The patients rave about her adjusting skills and quality care. Dr Jessica likes to say, "If your a hammer then everything is a nail; but, if you have many adjusting tools in your tool box, you choose the one that fits the patient." 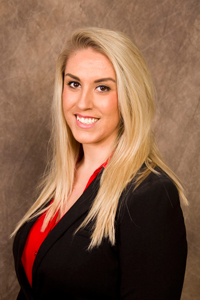 Dr Jessica likes to treat all kinds of Chiropractic problems from Arthritis to Whiplash. But, she specializes in Low Back Pain, Neck Pain, Headaches, Sciatica, Herniated and Bulging Disc problems and Join Pain (Shoulders, Hips, and Knees). She uses our onsite physiotherapy and complete rehab. Dr Millar went on to say, "Dr Jessica seems to have that 6th sense on just how to treat each patient to produce the best results possible and help them with their condition. That can't be taught. It has to be learned over time." You've probably have seen Dr Millar on ABC Waay TV Channel 31 over the years. Dr Millar is the CEO of Millar Chiropractic Clinics and spokesperson for the clinics. Dr. Millar says, "Doctor means teacher, and Dr Jessica Davis is a wonderful teacher to her patients. She teaches them about Health and Wellness, Exercises, as well as Nutrition, Diet and Fitness." 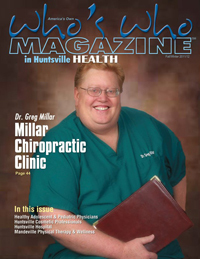 Millar Chiropractic - Huntsville Al (Jones Valley) is a place of healing and learning. Dr. Millar practices by appointment only at Millar Chiropractic Jones Valley. The Doctors of Millar Chiropractic - Huntsville AL (Jones Valley) treat from Arthritis to Whiplash but specialize in 6 areas: 1) Low Back Pain (with or without disc problems) 2) Neck Pain (with or without disc problems) 3) Headaches and Migraines 4) Sciatica 5) Joint Pain and Problems (foot, knee, hip, shoulder, elbow, wrist) 6) Personal Injury auto accidents.